Gone are the days when you had to spend close to £1,000 to grab a large-screen smartphone with great specs and a dual camera. Samsung, Nokia and Huawei have released some affordable Android alternatives, and we’ve run them through our test lab to see which comes out on top. 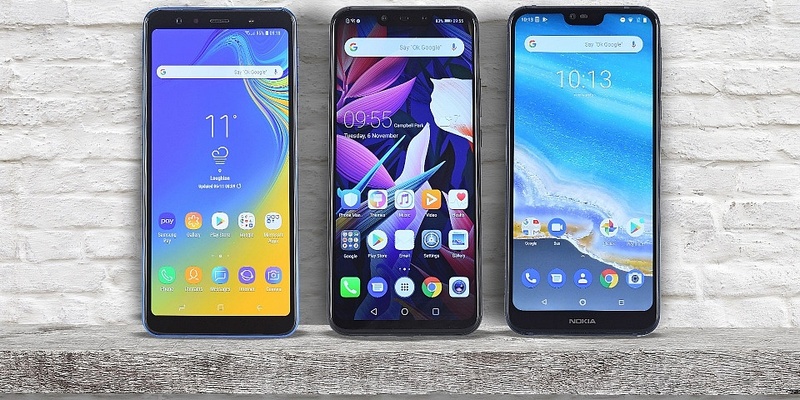 The Samsung Galaxy A7, Nokia 7.1 and Huawei Mate 20 Lite all cost under £400 – and the cheapest of the bunch is just £229 Sim-free. But that’s not all. After exploring the Sony Xperia XZ3’s key features in our first look review (including the odd 3D-model-generating camera), the sophisticated mobile has now been subjected to our battery tests. See how it got on below. 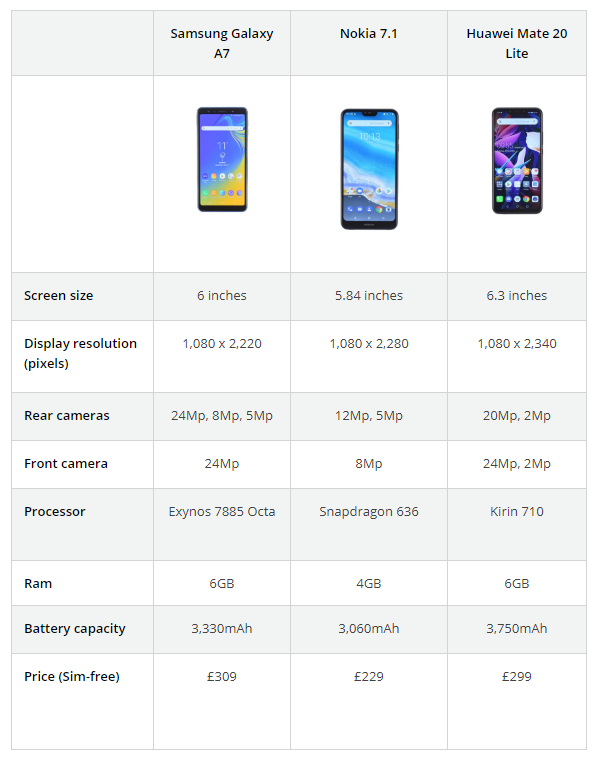 Samsung Galaxy A7 (£309) – are three cameras better than one? Samsung is convinced that the ‘intelligent’ triple camera setup on the Galaxy A7 makes this smartphone a real bargain at around £300, so we ran it through our lab tests to find out. The Galaxy A7 has a sizable 6-inch screen housing 2,220 x 1,080 pixels. Surprisingly, a fingerprint scanner sits on the side of the phone rather than under the display or on the phone’s back. Facial recognition is also supported, so you can unlock the Galaxy A7 in seconds with a quick glance. The triple camera is arguably the most exciting feature on the Samsung Galaxy A7 – though we have found that more lenses don’t always make for better photos in the past. The rear-facing shooters are made up of 24Mp, 5Mp and 8Mp cameras, with the phone allowing you to shoot Full HD 1080p video at the touch of a button. Flip the phone over and you’ll see a single 24Mp front-facing camera – it supports Samsung’s Smart Beauty feature, which essentially airbrushes your photos. 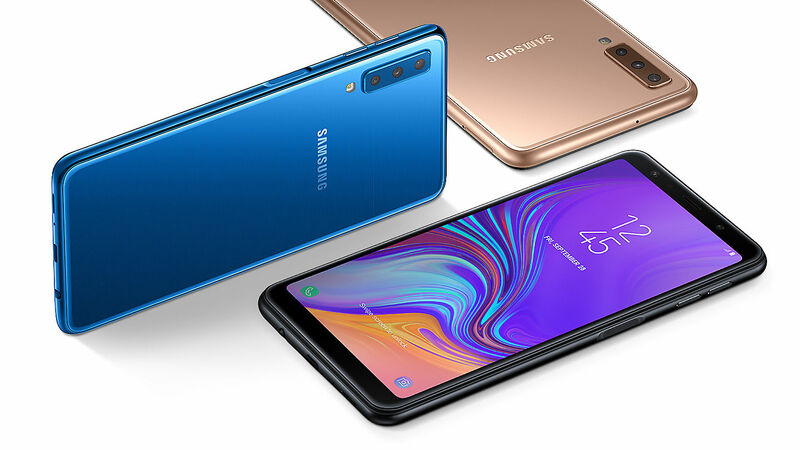 The Samsung Galaxy A7 is remarkably cheaper than the Samsung mobile before it, the Galaxy Note 9. Does a big drop in price mean a big drop in quality? Our Samsung Galaxy A7 review has the answer. After marking its return to the smartphone market in style with the retro-inspired Nokia 3310 remake, Nokia has since turned its attention to big-screen Android mobiles. 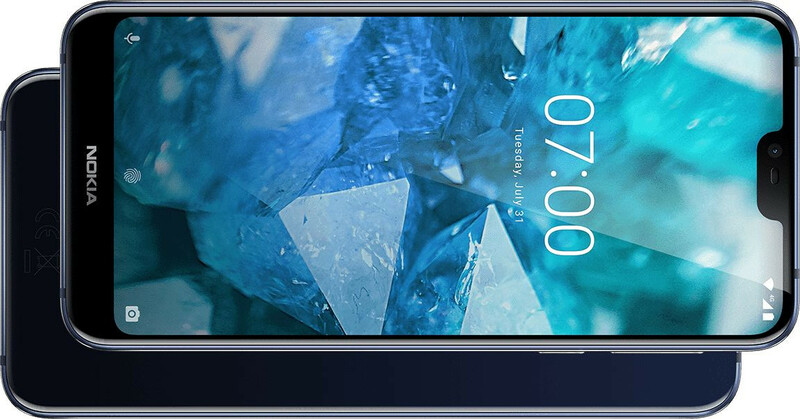 The Nokia 7.1 is the third new entry to the Nokia 7 range released over the past year, featuring a 5.8-inch display and a glass front and back. It’s powered by a Qualcomm Snapdragon 636 processor and arrives with 32GB of internal storage out of the box. You won’t find a fingerprint sensor on the back of this smartphone – it’s integrated underneath the display. To unlock the Nokia 7.1, you simply press your finger against the fingerprint symbol on the screen. We’ve tried similar technology on the far pricier Huawei Mate 20 Pro and the slightly cheaper OnePlus 6T. Nokia is well known for its battery quality, so how many hours of screen time can you get from this mobile on a single charge? Head over to our full Nokia 7.1 review for the details. This smartphone has the biggest display of the three mid-range devices in our table – it’s 6.3-inches big. The display is Full HD+, running at 2,340 x 1,080 pixels. There are cameras all over the Mate 20 Lite. A 20Mp and 2Mp lens sit on the back of the smartphone just above the fingerprint scanner, and there are two more cameras on the front, comprised of a 24Mp and 2Mp lens. 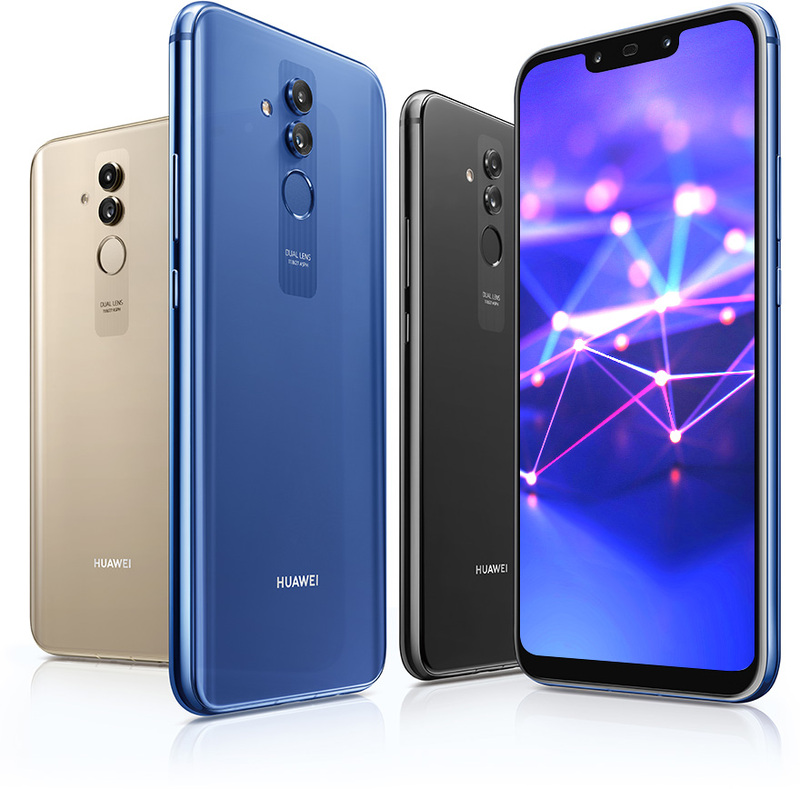 Like many of the Huawei smartphones before it, the Mate 20 Lite uses an AI assistant to help you get better results from its rear camera. When you point the camera at an object or landscape, the phone will automatically scan the scene and adjust brightness and colour settings to get you a more impressive-looking photo. Other notable features of the Huawei Mate 20 Lite include facial recognition and support for fast charging. Huawei boasts that the AI helper can guarantee stunning pictures, but does it deliver? We’ve tested the front and rear cameras in our Huawei Mate 20 Lite review. Sony has had its work cut out competing with flagship models from the likes of Samsung and Huawei, but it’s pulled out all the stops with the XZ3. 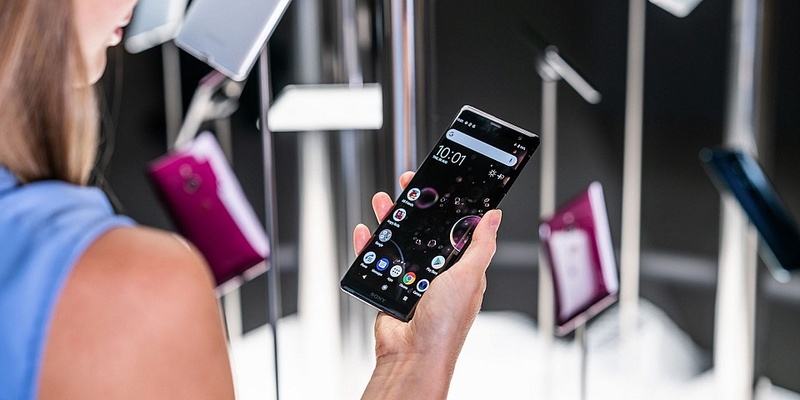 It’s a beautiful looking device that certainly impresses when it comes to aesthetics – the sleek, curved glass design and borderless 6-inch QHD display suggests Sony is taking this challenge very seriously. All of this makes the XZ3 feel like a significant upgrade over the Sony XZ2 and XZ2 Compact, and with staples of Sony’s previous models present and correct – waterproofing, ambitious cameras (including a 19Mp ‘intelligent Motion Eye camera’ to catch movement) and ‘a battery that lasts all day’ suggests Sony is looking to build on its strengths and complement them with cutting-edge design. At an eye-watering £699, all of this promise will have to be fulfilled though, and we don’t take anything for granted in our tough test labs. Read our Sony Xperia ZX3 review to find out whether it can justify the high price. One way to find a top mobile phone for less is shopping for discounts – we’ve done the hard work for you in our guide to the best Sim-free mobile phone deals. How do cheap smartphones perform in our tests? When it comes to buying a new smartphone, the first decision you’ll need to make is often based on price – how much money are you willing to spend? There’s no doubt that the mid-range market – phones costing around £200 to £400, has had somewhat of a renaissance in 2018. As technology has evolved and become cheaper to produce, genuinely powerful and featured-packed devices are now available for a lot less. So is there really a need to pay more? 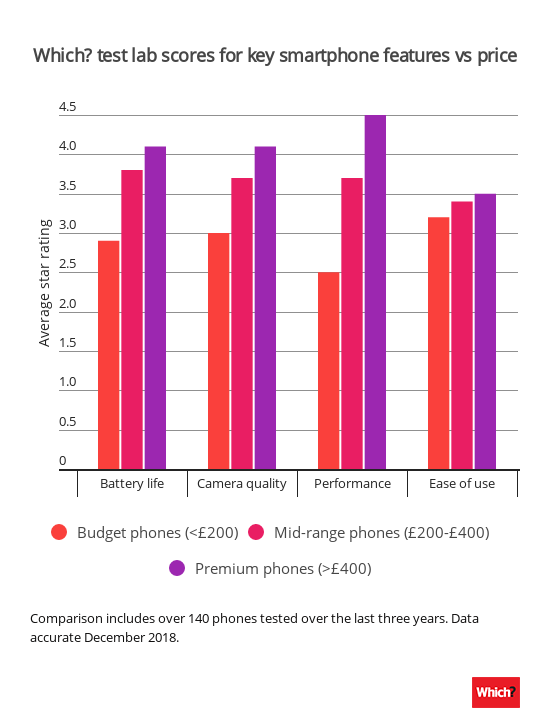 In the table below we compare budget phones (under £200), mid-range phones (£200-£400) and premium phones (over £400) to take a closer look at the differences when it comes to key factors like battery life, camera quality, performance and ease of use. As you can see, mid-range mobiles aren’t far behind premium alternatives for battery and camera quality, so if these factors are most important to you, a mid-range model might be enough. Performance is where you’ll see a bigger difference – the processors found inside expensive smartphones are better-suited to running lots of apps at once. Find out more about smartphones that cost between £200-400 and how they compare in our guide to the top five best mid-range mobiles.